Chief of the Darjeeling Council of the Great White Brotherhood, chohan of the first ray and hierarch of the etheric Temple of Good Will over Darjeeling, India. He is the founder of The Summit Lighthouse and the guru and teacher of the messengers Mark L. Prophet and Elizabeth Clare Prophet. He represents the godly attributes of courage, certainty, power, forthrightness, self-reliance, dependability, faith and initiative. These are the qualities of the Father principle—the statesman, the executive, the ruler. Because he has ably outpictured these essential virtues, El Morya has, through many embodiments, worn the crown of authority, ruling many kingdoms wisely and well. His rulership has not been that of a dictator, demanding that his subjects submit to his human will; but rather, his interpretation of government is God-over-men and his concept of true statesmen is God’s overmen. He inspires in his subjects illumined obedience to the holy will of God. Throughout his many embodiments to the present hour from the ascended state, beloved El Morya has been actively engaged in service to the light. As the son of Enoch, who “walked with God and was not for God took him” in the ritual of the ascension; as one of the seers who penetrated into the higher octaves of light in the ancient land of Ur of the Chaldees; and as a native of Persia, who worshiped the One God, Ahura Mazda—in these and during many other embodiments, he learned to experiment with “divine electricities,” becoming increasingly aware of the spiritual power flowing through man. Later he became accomplished in the constructive use of fohat—the mysterious electric power of cosmic consciousness (quiescent or active)—that impelling vital force, which, when called into action by divine fiat, moves the evolutions of a universe, a galactic or solar system, or even a human being from the beginning to the completion of its mission. 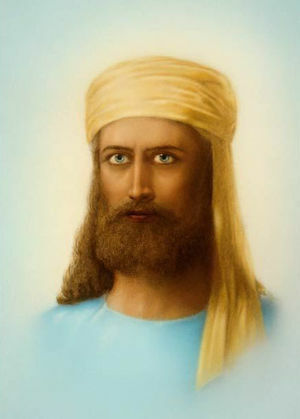 El Morya was embodied as Abraham (c. 2100 B.C. ), the first Hebrew patriarch, the prototype and progenitor of the twelve tribes of Israel. Judaism, Christianity and Islam all trace their origins back to Abraham. Although scholars once widely assumed that he was either a mythical figure or a nomadic or semi-nomadic Semite, archaeological finds since World War I have corroborated the picture of Abraham that is given in the Bible itself. In answer to the call of the LORD, Abraham left the leading Sumerian city of Ur, forsaking the culture and cults of Mesopotamia at a time when Sumerian civilization was at its height. The LORD told him to journey to a land that he would show him and promised to make of him a great nation. The Book of Genesis describes him as a man rich in flocks and herds who commands a private army and is recognized by neighboring chieftains as a mighty prince. Abraham is the archetype of the man of faith. He received the supreme test of faith when God told him to sacrifice his son Isaac. 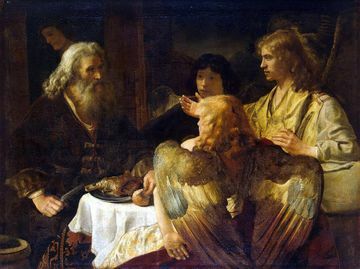 Abraham had waited many years for his wife Sarah to bear Isaac, who was to be the fulfillment of the LORD’s promise to multiply Abraham’s seed as the “stars of the heaven.” Nevertheless, Abraham obeyed, and as he raised his knife to kill his son, the angel of the LORD told him to stop, and Abraham offered a ram in his place. As King Arthur (A.D. fifth century), Guru of the mystery school at Camelot, he guarded the inner teachings. He summoned knights of the Round Table and ladies of the court to quest the Holy Grail and to attain through initiation the mysteries of Christ. While he wore the crown, unity, order and peace prevailed in England. Saint Germain was embodied as Merlin, mystic counselor of King Arthur and his knights of the Grail quest. As Thomas Becket (1118–1170), he was Lord Chancellor of England and good friend and advisor of Henry II. When he became archbishop of Canterbury, foreseeing that his duties as archbishop would inevitably conflict with the king’s will, he resigned the chancellorship against the king’s wishes. Becket turned his administrative abilities and diplomatic finesse as a distinguished chancellor into ardour and devotion as archbishop. He became as strong a supporter of the papacy as he had once been of the king and freely excommunicated courtiers and nobles for their unlawful use of church property and other breaches. In the face of the king’s intent to imprison him, Becket exiled himself to France for six years. He returned to England following a partial reconciliation with the king, only to begin quarreling with him anew. 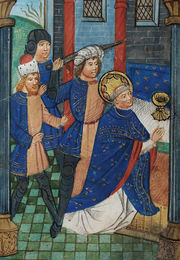 On December 29, 1170, he was brutally murdered in Canterbury Cathedral when four knights of the court took literally the king’s remark that he wished to be rid of “this turbulent priest.” Uncompromising to the end, Becket told the knights: “If all the swords in England were pointing at my head, you would never make me betray either God or the Pope.” More than five hundred healing miracles were attributed to him only a few years after his death, and he was canonized three years later. Morya was also embodied as Sir Thomas More (1478–1535), the “man for all seasons.” More’s deep devotion to God caused him at one time to consider a religious vocation and to practice extraordinary austerities for over four years to test his own self-discipline. He decided to marry, however, and his wife and four children proved to be his greatest joy and his sole comfort in days to come. Their famed estate at Chelsea housed Thomas’ entire family, including eleven grandchildren. Over the years, More’s “little Utopia,” as he often called it, became a center of learning and culture, likened by Erasmus to “Plato’s academie”—a home of good will to which came the most learned men of the day, even the king himself, for counsel and for comfort. At Chelsea, More wrote the famous work entitled Utopia, a witty exposé of the superficiality of English life and the flagrant vices of English law. 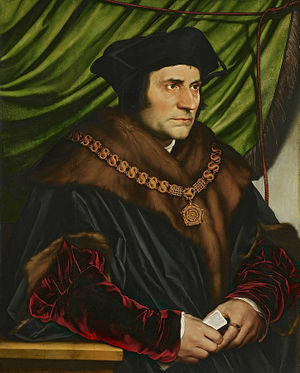 In 1529, Sir Thomas More was appointed by Henry VIII Lord Chancellor of England and Keeper of the Great Seal. In spite of many honors and achievements, More sought no man’s esteem; he was known for his promptness, efficiency and even-handed justice. He remained sensitive to the needs of the common people by daily walking the back streets of London to inquire into the lives of the poor. Sir Thomas devoted himself to his duties with utmost zeal until Henry, desirous of but lacking a male heir to the throne, declared his marriage to Catherine of Aragon null and announced his intent to marry Ann Boleyn. Since the divorce was without papal approval and directly opposed to the laws of the Church, More refused to support the king’s decision. In 1532, at the height of his career, he resigned his office and retired to Chelsea, where, greatly concerned with the heresies of Luther’s revolt, he continued his writings in defense of the Catholic faith. Without friends and without office, More and his family lived in abject poverty. Nevertheless, Henry had been insulted at the chancellor’s public disapproval of him. The king, therefore, sought to defame More and thus restore his royal image. When he refused to take the Oath of Supremacy (which implied the rejection of papal supremacy and made Henry the head of the English church), More was imprisoned in the Tower of London. Fifteen months later, he was convicted of treason on perjured evidence. He was beheaded on Tower Hill July 6, 1535, affirming himself “the king’s good servant, but God’s first.” He was canonized four hundred years later in 1935. Lawyer, judge, statesman, man of letters, author, poet, farmer, lover of pastoral life, ascetic, husband and father, champion of women’s education, humanist and saint, Thomas More was outstanding among the avant-garde of the English Renaissance. Morya was next embodied as Akbar the Great (1542–1605), founder of the Mogul empire in India and the greatest of its rulers. During his reign, he ended all discrimination against the Hindus and accepted them into government, serving on an equal basis with the Muslims. His policies were considered to be among the most enlightened of his time. He was also Thomas Moore, the Irish poet (1779–1852), who wrote many ballads and is best remembered for “Believe Me If All Those Endearing Young Charms.” To this day, the song draws the power of his intense love for the will of God as representative of the highest good—the immaculate image of every soul, untarnished by the burdens of the world. In his final embodiment, El Morya was born a Rajput prince in India and later became a monk frequenting the retreats of the Himalayas. As the Master M., he, together with Kuthumi and Djwal Kul, attempted to acquaint mankind with the workings of the Law and hierarchy through the writings of Mme. H. P. Blavatsky. Together with the Master K.H. and Saint Germain, he founded the Theosophical Society. Morya ascended in 1898 and continues his great work for God-government on earth through the flame of goodwill and his embodied chelas. El Morya has said that his name is Maraya. The Ma stands for the maternal influences of God. The Ra stands for the Father, the masculine influences of God, called by the ancient Egyptians Ra. We call it ray today, as in a ray from the sun. Ya is the flaming Yod or the power of the Holy Spirit, the third part of the Trinity of divine consciousness. El in the ancient Hebrew refers to the Elohim or to God. So in the name Morya El, or Maraya El, we find a nameless one who deliberately chose a name to glorify God and to whom was given a new name which he used, which glorifies God. In analyzing many of the names of the Great Ones, even Sri Magra and others before, we find that always the names have been identified with the Godhead, because the individuals themselves have been absorbed into the Godhead. El Morya is the hierarch of the Temple of Good Will in the etheric plane over the city of Darjeeling, India, in the foothills of the Himalayas. This retreat is a mandala and a forcefield that is used by the solar hierarchies to release increments of cosmic energy to the planet. Together with the members of the Darjeeling Council, the Brothers of the Diamond Heart who serve at this retreat under El Morya assist mankind by organizing, developing, directing, and implementing the will of God as the foundation for all successful organized movements. My service then continues from the Darjeeling Retreat of the Brotherhood, where I am counseling, with other brothers of the will of God, so many of the evolutions of earth who serve in the governments of the nations, who serve as teachers and scientists and musicians, and those who control the flow of the will of God that is power, that is the abundance of supply. The will of God is applied in all levels of human endeavor, for the will of God is the blueprint of every project. It is the foundation of every task. It is the skeleton of your body. It is physical energy. It is etheric fire. The will of God is the fiery diamond in your heart. The diamond-shining mind of God is the very heart of any endeavor. 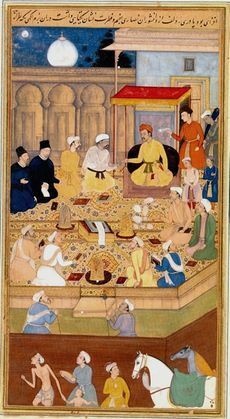 Public servants, world and community leaders, and holders of public office are schooled between embodiments and in their finer bodies during sleep to renew the charge of Morya’s thrust for a purpose and to refresh their understanding of the intricacies of the will of God in politics, in religion, in business, and in education. Ascended and unascended masters and their chelas meet at Morya’s retreat frequently to discuss national and international problems and the means to their solution. It was here that Ascended Master El Morya received President John F. Kennedy after his passing in 1963. During the 1920s and 1930s the Ascended Master El Morya worked with Nicholas and Helena Roerich, who set forth his writings in numerous published works. El Morya founded The Summit Lighthouse in 1958 in Washington, D.C., for the purpose of publishing the teachings of the ascended masters given to the Messengers Mark and Elizabeth Prophet, a continuation of his efforts in so many incarnations to establish the concept of God-government on earth. The calling of the messengers has manifested in manifold endeavors sponsored by the Darjeeling Council: the establishing of the order of the Keepers of the Flame Fraternity by Saint Germain in 1961 to set forth graded instruction in cosmic law; the founding of Montessori International by Mother Mary, Jesus, and Kuthumi, based on the principles of Maria Montessori and including the teachings of the ascended masters; the founding of Summit University; and the setting of the seal of God upon Church Universal and Triumphant, the mystery school of all of the masters of the Great White Brotherhood and the community of souls ascended and unascended on the path of initiation, East and West, in Christ and Buddha. El Morya told us that beginning January 6, 1998, the three wise men, El Morya, Kuthumi and Djwal Kul, will teach us the keys to the path of the ascension and sponsor all who aspire to make their ascension in this life. These masters will help us balance our karma, and they will stay until certain key souls have made their ascension. El Morya, Kuthumi and Djwal Kul represent the three plumes of the threefold flame of the heart—El Morya, the blue plume; Kuthumi, the yellow plume; and Djwal Kul, the pink plume. They come to bring our threefold flames into balance with theirs. If you follow the three kings and the star of the Christ Child, you will arrive at the manger scene of your own Christ-potential and your own Christhood. Constancy is the key virtue that I must have in those who truly desire to be one with me. If I would train you personally, beloved, I must have from you an unflinching constancy whereby you maintain a steady level of absorption of the blue flame of the will of God and thus enter day by day into the sacred fire of the first ray. You must be willing to take any rebuke, any correction, to take it swiftly and to then swiftly self-correct. You must have a momentum on giving the decrees to the ascended masters who serve principally on the first ray. You may give any (or all) of the blue decrees, whether they be to me or to Surya or to Himalaya or to Vaivasvata or to Archangel Michael. I tell you, beloved, when you keep yourself saturated in the blue ray and you are alert to every out-of-step state of mind that you might even consider entertaining, you will find that I shall become your champion. Once I become the champion of a chela, I will work with that chela to the end. Thus, beloved, do not think that I take lightly the taking on of a chela. Many of you are chelas in the becoming. But I must test and try you for many years, sometimes for lifetimes, before I receive the signal from Almighty God himself that I might burden myself by taking on another student. Realize this, beloved: It is well to make yourself a devotee of the will of God. For as a devotee, you will increase! and increase! and increase! many shades of blue rings around your four lower bodies and the circumference of your life. And when you have proven yourself under fire and in many situations—untenable situations, devastating situations—and have come out right side up, we will know that we have a chela of the first order, and we will receive you that you might be anointed before the council in Darjeeling. Yes, this is a very special opportunity, and all can make themselves worthy. I speak of it, beloved, because I have surveyed the earth and I have listened to the dictations that have been given at this class and I understand that there are many, many people in the world who would seek and find this teaching if they knew it existed somewhere. Since I am about to sponsor millions of souls for this activity and this path, I must be certain that you who are here and who form the foundations of this community throughout the earth are true to me. As the chief of the Darjeeling Council of the Great White Brotherhood, Morya presides at round table meetings in his Retreat of God’s Will in Darjeeling where the souls of the world’s statesmen and men and women of integrity in God’s will convene to study under this living master. 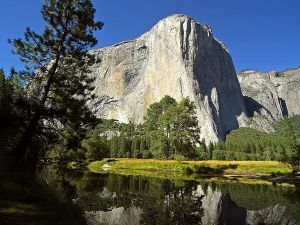 Morya has a second retreat in El Capitan, in Yosemite Valley, California. El Morya’s musical keynote, capturing the frequencies of his Electronic Presence, was set forth in part by Sir Edward Elgar in his “Pomp and Circumstance.” His flowers are the blue rose and the forget-me-not, and his fragrance is sandalwood. El Morya, The Chela and the Path: Keys to Soul Mastery in the Aquarian Age. Mark L. Prophet, August 6, 1972. ↑ El Morya, July 3, 1965. ↑ El Morya, “To Awaken America to a Vital Purpose,” April 16, 1976, in Mark L. Prophet and Elizabeth Clare Prophet, Lords of the Seven Rays, book 2, chapter 2. ↑ El Morya, “Clean House!” Pearls of Wisdom, vol. 38, no. 26.